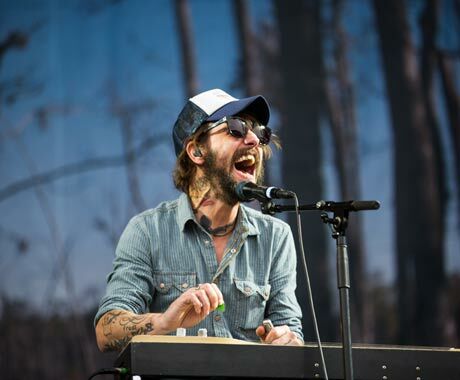 Seattle born, Charleston, SC-based alt-country quintet and indie rock royalty Band of Horses delivered their brand of country rock on Friday, singer Ben Bridwell showing off his sugary voice while strumming the peddle steel and electric guitars through the band's hits. Band of Horses attracted a crowd of head bobbers, mouthing the words to their favorite songs, but their mellow cloudy-day style had a hard time keeping the attention of the fans, even during their more upbeat numbers. Highlights of the show included songs "The General Specific" and "Is there a Ghost?" from 2007's Cease to Begin, "Laredo" from 2010's Infinite Arms and "Knock Knock" from their 2012 effort Mirage Rock. Missing from the setlist were hits like "Factory" and "Dilly," but with a shortened festival set, it's forgivable. Band of Horses on stage are very relatable. Band of Horses put together a performance that reflects the band's low-key style, but still felt accessible and enjoyable.